Nice shot, but the motion blur might hurt your score on this one. I'd try cropping a bit off of the top and bottom to accentuate the movement here. Lots of motion blur here, even on the animal itself. Sorry, 4. Uh-oh. Fun to look at but you're going to get some big hits on meeting the challenge by stopping the motion and no motion blur trails, etc... I like the placement of the deer in the frame, that's good standard composition for a moving subject to leave space in front. Exposure is good. Good luck in the challenge. Glad to see someone not overly influenced by Disney's Bambi. Unfortunately the thief is a bit blurred. 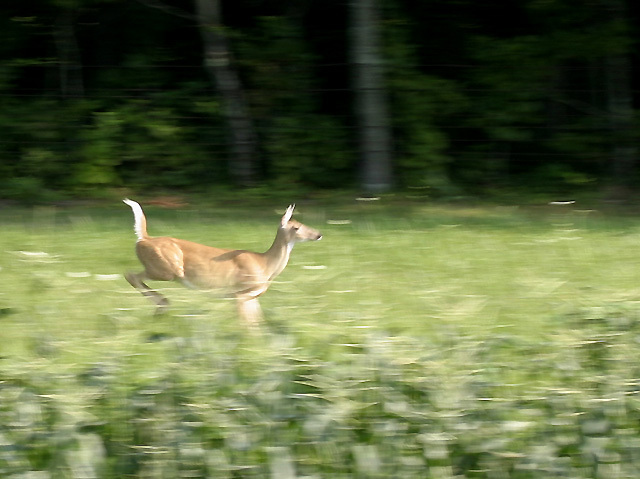 The composition is good with the deer running into the frame and I always like the blur effect associated with panning but the deer is just not sharp enough. Good catch! Focus could be a little stronger on the deer IMHO. Well....you Almost stopped the motion. to blurry for me. >>Catch your subject mid-action -- that means no motion trails! Proudly hosted by Sargasso Networks. Current Server Time: 04/19/2019 02:19:27 AM EDT.